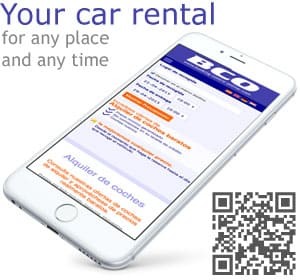 BCO, leader company in the Rent a Car area, offers rent a car services all around the world, and especially in the Spanish market since 2001. We are pleased to say that most of our clients get to us by recommendation of veteran users of our firm. In BCO, you will receive friendly and personalized assistance because that is our human team´s way. The kindness and professionalism of each one of the members of our team will make you feel as if you had known them forever. We are one of the businesses in the sector that receives the smallest amount of complaints due to the experience that we have in the Online car rental service. We work with several collaborating companies to be able to offer you the best option for car rental vehicles anywhere in the world. Booking Centre Online (BCO), is a LOW COST company from which you can rent a car at the best price in the market. We offer you an extensive comparative list of vehicles for rental made up with the fleet of all ours collaborators and we always highlight the most economic vehicles for you. The fleet of vehicles is continuously revised and renewed each 6 to 12 months so that you always have the feeling of driving a new car. Do not think it over anymore and try our service. We are sure you will be delighted by the personnel assistance and the product offered. If there is something you do not like, please let us know so that we can improve it. And if you are not satisfied, you will get your money back.